The Beolab 3000 was an amplified version of the Beovox 3000 panel loudspeaker. 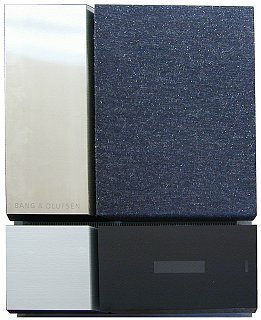 Unlike the other amplified and active Beolab loudspeakers, the complete amplifier and display unit was completely self-contained and separate from the loudspeaker, which was an unmodified Beovox 3000. The amplifier was designed so that it fitted neatly onto the bottom, and was secured at the rear by two steel strips. A short “pigtail” lead emerged, which was connected to the loudspeaker’s binding post terminals. Text copyright © Beocentral. Unauthorised reproduction prohibited. The amplifier gave a single output of around 55W. The main active element was a mono amplifier hybrid IC made by Sanyo of Japan, though there was much else of interest besides. The Beolab 3000 could not be described as “active” in the sense that (for example) the Beolab 8000 was, since there was no electronic crossover or separate amplifier for each drive unit, but unlike the Beolab Penta, some electronic equalisation was included. This took the form of a level-dependant bass-boost circuit controlled by the built-in microprocessor (whose main function was to operate an LCD readout panel on the front of the amplifier). The equaliser itself was formed around a novel circuit known as a “gyrator”, which used a pair of low-level amplifiers to simulate the function of an inductor. By this scheme, large values of inductance could be simulated without the disadvantages of conventional wound components, and the function of the circuit could be made variable. The amount of boost applied was dependant entirely on the level of the input signal at around 1KHz, there was no option for the listener to run the amplifier “linear”. Text copyright © Beocentral. Unauthorised reproduction prohibited. As with Beolab Penta 2, the input signal could be accepted as either line level through an RCA socket, at loudspeaker level from the output of another amplifier through Speakerlink, or by PowerLink. Switches at the rear selected which method was used, and at what level. If Speakerlink or Powerlink was used from a suitable Beocenter or Beomaster, a backlit LCD display became visible in the black part of the amplifier front panel, which conveyed basic information about the source, programme and volume level. A switch at the side of the amplifier set up the display for use with either audio or video sources, and could also be used to switch the loudspeaker off if it was not needed. Text copyright © Beocentral. Unauthorised reproduction prohibited. Beolab 3000 was replaced by the Beolab 4500. Text copyright © Beocentral. Unauthorised reproduction prohibited.